The headline reads: Deal struck to tear down 106-foot dam; would be largest dam removal in California. 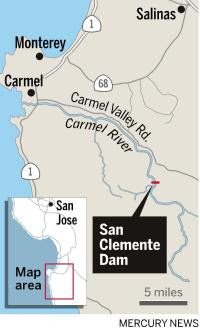 "A $150 million project to tear down the 165-foot Matilija Dam in Ventura County, which is also silted up, was approved in 2004 by county officials, but has not been implemented yet because of funding shortfalls. The question is which one will get the permits and the funding to go first."